Federica Mogherini, the Italian foreign minister appointed to become the next EU foreign affairs chief, said in the European Parliament today (2 September) that Russia was no longer the EU’s “strategic partner”, referring to the phrase which describes the relationship between the Union and its largest neighbour in hundreds of official documents. Mogherini spoke in the Parliament’s Foreign Affairs committee as foreign minister of the country holding the rotating EU presidency, but obviously many MEPs sought to test her skills for handling the crisis in her future capacity. A total of 27 MEPs asked Mogherini questions. Some MEPs from the Baltic states attempted to challenge her capacities to deal with the Ukraine crisis, but she successfully slithered through the debate, speaking in excellent English and very good French. EURACTIV heard comments that Mogherini was “definitely better than [Catherine] Ashton”, the current EU foreign affairs chief. Mogherini refuted views that she had little interest in the Ukraine situation, stating that as a minister, her first visit, under the new Italian President, was to Kyiv, also saying that she has been holding weekly calls with her Ukrainian counterpart Pavlo Klimkin, who she called her good friend. Asked if she would make changes to the Italian Presidency programme, in which the word Ukraine appears only once in a sentence saying that EU attention would be “chiefly devoted to support of the normalisation process and internal stability”, Mogherini said this was not a problem. “If there is one sentence that I would change in the [Italian Presidency] program, it is the first one in the chapter relating to Russia […] that says Russia remains a strategic partner in tackling regional and global issues. I would change this”, she said. “I think Russia stays a strategic player in the regional and global challenges, [regardless if] we like it or not, but I don’t think it’s a strategic partner anymore”, Mogherini said. Then she added: “I wish it could go back in the future, I wish Russia would choose to go back to be a strategic partner in the future, but I don’t think this is what is happening now”. Mogherini was asked tricky questions by Bulgarian MEP Andrei Kovachev (EPP), who tried to test her positions regarding the controversial Gazprom-sponsored South Stream gas pipeline. Italy, as a major destination of the gas to be transported by the planned pipeline, is a strong supporter of the project. Mogherini kept her answer short, but clearly indicated that she was not advocating the Italian interest. She said the Union strongly supported the Southern gas corridor, a jargon term referring to the TANAP-TAP project to bring Azeri gas to Italy through the territories of the same countries. The Trans-Anatolian gas pipeline (TANAP) is a proposed natural gas pipeline from Azerbaijan running through Turkey. The approximately 870 km long TAP pipeline connects with TANAP, and will cross Greece and Albania before reaching Italy through an offshore section. Regarding South Stream, which many pundits see as a direct competitor to the Southern gas corridor, Mogherini said the project “was thought in another era” and “could contribute” to diversification of routes, provided that not only technical conditions, but also political conditions were met. South Stream is frozen until the Commission and Gazprom sort out a legal mess with the bilateral agreements with transit countries, which contain scores of breaches to EU law. But Mogherini didn’t answer another question by Kovachev, regarding Ukraine’s ambitions to join NATO. Ukrainian Prime Minister Arseny Yatsenyuk said on 29 August that his government will introduce a proposal in Parliament to change the non-aligned status of the country, and to request membership of the Atlantic alliance. A NATO summit in Cardiff on Thursday and Friday is expected to return to the matter. Answering a question on the new sanctions the EU is expected to adopt against Russia following the 30-31 August summit, Mogherini said that those will not be of the category of “stage three”, but would expand the range of current financial sanctions targeting officials responsible for Russian military actions in Ukraine, restrictions on arms and dual-use materials, and technology. In diplomatic jargon, “third level” sanctions refer to economic sanctions that are intended to hit Russia’s major economic players. Those however would have negative consequences for EU businesses. Reportedly at least three EU members – Slovakia, Hungary and Cyprus – oppose the third level of sanctions. The decision on the new sanctions will be adopted on 5 September, Mogherini said. European heads of state and government appointed Mogherini on 30 August, as the new High Representative for foreign and security policy, the de facto foreign affairs minister for the EU. Just last month, EU leaders failed to agree on her candidacy. The Baltic states and Poland saw her as inexperienced and too soft on Russia. Mogherini has also only been Italy's foreign minister since February. Some leaders reproached Mogherini for having said, after talks in the Kremlin on 9 July, that Italy was ready to support for the energy dialogue between Russia and the European Union in order to promote the implementation of the South Stream gas pipeline project. The construction of the Russia-sponsored South Stream gas pipeline, intended to pump Russian natural gas directly to Europe and bypass countries such as Ukraine, was seen as an issue where the Italian interest could enter in conflict with a broader EU position. Proficient in English and French, Mogherini graduated from Rome's Sapienza University with a degree in political science and a thesis on Islamic politics that she completed during studies in Aix of Provence (France), where she spent some time as an Erasmus student. She was elected to parliament for the first time in 2008, joining the lower house committee on foreign affairs. In her climb up the party ladder, Mogherini held a series of foreign policy positions until claiming the group's top foreign policy job last year. Her foreign policy experience consists of stints representing her country in the parliamentary assemblies of both NATO and the Council of Europe and as a fellow at the German Marshall Fund. Dnevnik, EURACTIV partner in Bulgaria: ???????? : ????? ???? ?? ? ????????????? ???????? ?? ? ?, ???? ???? ??????? ?????? EURACTIV Greece: Mogherini: ? ????? ??? ???????? ????? ?????????? ?????? An excellent start to a strong-sounding candidate who appears on top of her brief. The EU needs to hold its nerve in the coming months. 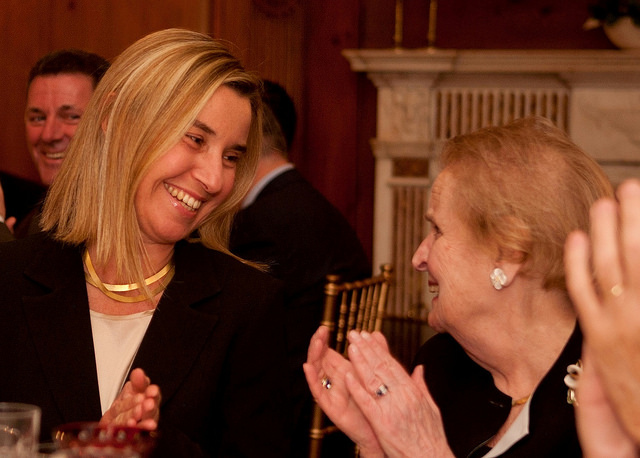 Mogherini looks like a good candidate to handle the many challenges the EU faces.